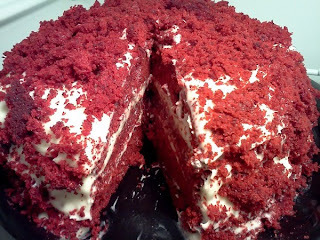 Flour Mayhem: Red Velvet 'White Out' Cake. 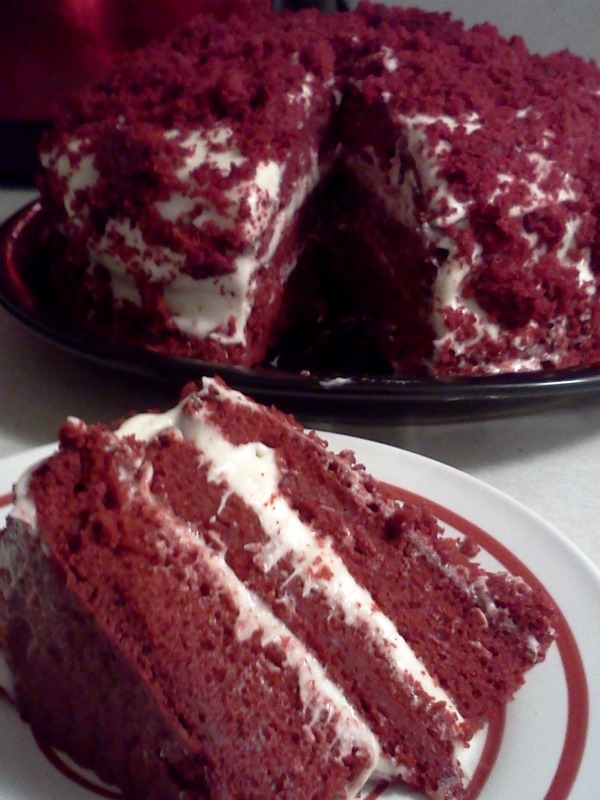 Red Velvet 'White Out' Cake. This past week a friend posted a photo of a cake she had made called a devil's food white out cake. I have never heard of that cake before, and was really intrigued. So of course I googled it, and found out all about it - kind of. The cake is from Dorie Greenspan'sbook Baking: From My Home to Yours. I do not own the book, but I do think it would be a good book to add to the collection. Now when I learned all about the cake (kind of learned) I knew I for sure wanted to make one, but I wanted to make my own. 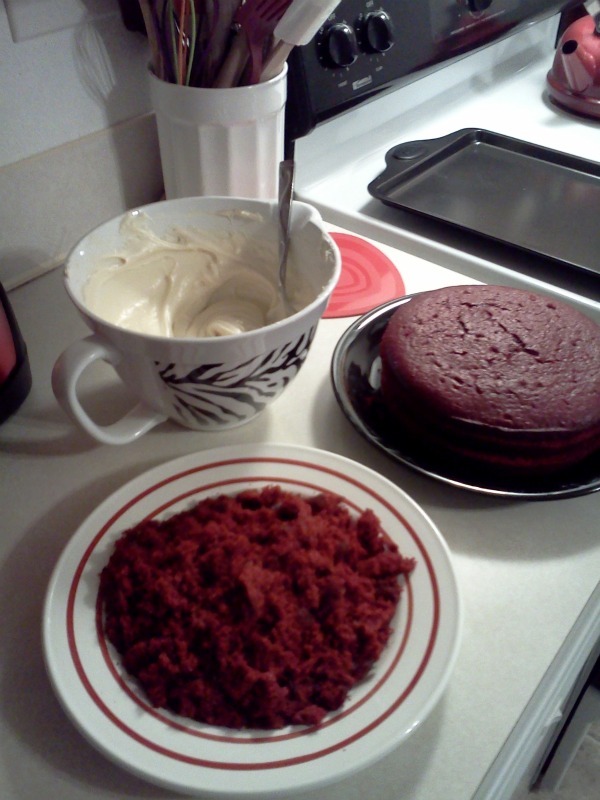 Red velvet is our favorite cake, so that was that. The idea of this cake is pretty rad, and I have to give props to Dorie Greenspan. Who woulda thought this would be so pretty? I sure didn't but I am stoked on it. 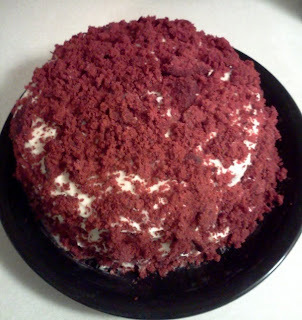 I'd also like to give a shout out to my lady Emi, she originally posted her cake and totally got me intrigued. Thanks for the Inspiration!!!! For the frosting I use my favorite. In a larger mixer bowl, cream together butter and sugar. Add eggs one at a time, beating well after each addition. In another bowl, mix red food coloring and cocoa until cocoa is completely dissolved. Add to the creamed mixture. Mixing on low speed, add buttermilk and flour alternately, beginning and ending with flour. Mix well but do not over-beat to ensure a light fluffy cake. Add vanilla and mix well. Blend the baking soda into the batter.Transfer into two floured and greased 9 inch round cake pans. Bake in preheated 350F oven for 25-30 minutes. Cool completely. Make frosting as desired. Cut both cakes in half, resulting in four slices. Lay one slice down, frost top, lay another slice down, frost some more, finally put on the top, and frost the entire cake. Crumble the remaining cake slice and cover the cake with the crumbs. It seems easy, but it's kind of tricky. I got crumbs everywhere! As soon as Jason got home and saw the cake, he wanted a slice. It sure is a pretty looking thang, it also is pretty tasty. I highly recommend making this cake, be it the original devil's food, this red velvet version, or whatever it is you want to do. I had fun, and it was pretty easy.